THAT Scene is a recurring feature that takes a closer look at a single scene that exemplifies a particular show, theme or moment in time. The scene might be good or bad, but it will always be memorable and worth talking about. Many of the best sitcoms, both current and past, thrive on the strength of their ensembles. Happy Endings, Arrested Development, Cheers and Seinfeld are some of the best-known examples of half-hour comedies that work the best when they put their large casts in the same place and let them bounce them off one another. Up All Night doesn't work the same way. The core ensemble of Will Arnett, Christina Applegate and Maya Rudolph is half the size of Community's or Friends' six- and seven-person casts. The show has also been hit-or-miss at developing its secondary characters; for every Missy or Kevin there's a Luke or B-Ro who doesn't quite fit. 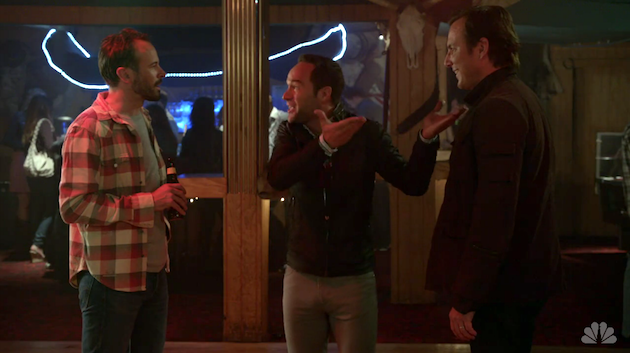 That alone makes today's scene - which comes from the show's season finale, "The Proposals" - unique; not only does it not feature Reagan or Ava, but it succeeds on the chemistry between Chris and two recurring characters, the aforementioned Kevin (Jason Lee) and Chris Diamantopoulous' amazing Julian. The odd thing is, Julian began as one of those secondary characters who didn't really work. When he appeared as a legitimate love interest for Ava, his sleazy come-ons and outsized sexuality were off-putting and uncomfortably cartoonish. However, once the other characters - particularly Ava - realized that Julian would never be any real competition for Kevin, and once the writers learned how to use Diamantopoulous' considerable comedic skills, he became one of my favorite recurring players. Diamantopoulous does some heavy lifting in this scene, which has to sell the two somewhat implausible plot developments that drive the rest of "The Proposals": Kevin's decision to win Ava back by proposing to her, and Chris' reveal that he found Reagan's engagement ring, which she thought was lost, had it reset with an added stone for Amy, and is now going to redo his botched proposal with it. Neither move makes a lot of sense, but Kevin's spur-of-the-moment decision is the more strained of the two; we haven't spent enough time with Kevin and Ava for an engagement to make sense (which, to give credit where credit is due, is the same realization that both characters eventually come to). The plot mechanics are somewhat contrived, but Arnett, Lee and Diamantopoulous have such great, easy chemistry and comic timing that the strain doesn't show. Up All Night really takes advantage of Arnett's gift for taking a seemingly matter-of-fact line reading and adding just enough weird spin to make it instantly memorable. The way he inflects the line, "This strange little gentleman is really starting to make some sense" is phenomenal, and both Julian's brush-off of the insult and Chris' quick aside, "Not a compliment," are perfectly timed. It's a seemingly casual exchange that is actually very tricky to pull off, but Arnett and Diamantopoulous nail it. Up All Night has also created a great character for Jason Lee. Kevin often ends up playing the straight man - an unavoidable outcome when your most frequent scene partner is Maya Rudolph - which makes the opportunity he gets here to really let loose and be funny extremely welcome. Kevin's angry, solo line-dancing is pretty damn hilarious, and the way that Lee lets his physicality get a little wild and messy is appropriate for both the character and the particular moment. As funny as Chris and Kevin both are, in this particular scene they're both playing second fiddle to Julian. Diamantopoulous gets some of the scene's biggest laugh lines; his excited reaction to Chris' announcement of his re-proposal, "I didn't even know that jazz was on the table!" is great both in writing - of course Julian would use the phrase "that jazz" - and in execution. Julian's excited puppy response also helps sell the reveal of the ring's location. Arnett does what he can with some clunky expository lines, but the way that Diamantopoulous screeches "The soapdish!" helps to break up the wordy moment and injects some much-needed comedy. Up All Night is ultimately a show about the core trio of Chris, Reagan and Ava. It works well that way. But this somewhat atypical scene serves as a great reminder of the possibilities that arise when the central ensemble interacts with similarly talented comic actors and lets the hilarity flow. And, of course, it always helps if there's line dancing involved.